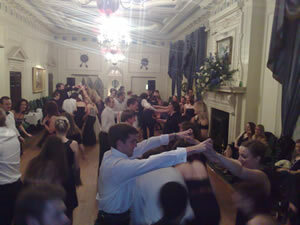 Corporate Dance specialise in dance lessons and dance workshops for companies. We provide a wide variety of dance services to businesses for any type of event or function. A really fun dance class where you learn a routine to your favourite disco tune! Or a more modern track if you prefer. Normally 1 to 2 hours long, this class can take place either before or after dinner. A ballroom/latin dance class for everyone followed by a few couples competing against each other to win prizes. The competing couples will be given extra tuition to learn a routine for the competition. Normally up to 1 hour for the main class and the couples can get extra tuition prior to the competition. We can teach you all a routine to absolutely any song... you choose the song. Then every time you hear the song after the event you'll be reminded of the routine and the fun time you had. Line Dancing isn't necessarily Country & Western styled these days. You can line dance to plenty of modern pop songs too. Normally 1 to 1.5 hours long, this is very popular for big evening events. Learn a routine to a song but don't tell anyone. Then get 'randomly'selected to get up and dance… and you nail it like a professional! Please also see our Corporate Dance - Party Dance Experiences flyer for more details. Dancing Workshops (any dance style) as a fun addition to any event. Choreographed dance routines for groups to learn a dance routine at any corporate event. X-factor style dance-offs and other fun dance competitions. After dinner dance lesson. From 20 to 300+ participants and pretty much any dance style. Ballroom, salsa, disco and line dancing being the most popular. Gets everyone up and having a great time. Strictly Come Dancing style lessons and competitions. Team building dance lesson to get your team working together like they never have before. It's also great fun. Any dance style can be covered, from ballroom or salsa, to disco or flamenco. It's going to break the ice with teamwork being essential. Disco dance is always a favourite. Everyone has a top tune from the 70's, 80's or 90's that with out fail will get them up on the dancefloor. In these dance lessons we will teach you disco moves and routines to whatever your favourite disco tracks are. From classic styles like ballroom, latin, line dancing, disco, jive & salsa to the more extrovert styles like the Argentine Tango, belly dancing, flamenco, bollywood and more! To find out more about our service, please go to our Company Dance Lessons page or call us and we'll be more than happy to help.